​The narrow-minded attitude of racism is treated in this design with a limited two dimensional image. One king insists upon supremacy and tries to suppress the other king. A racist is unaware of the great universal law which states that the emotions of love and hate are binding. This vicious circle continues until he learns that people are a unity, very much as our body is. Our right hand does not hate the left foot, because it is different. Every problem is an opportunity. 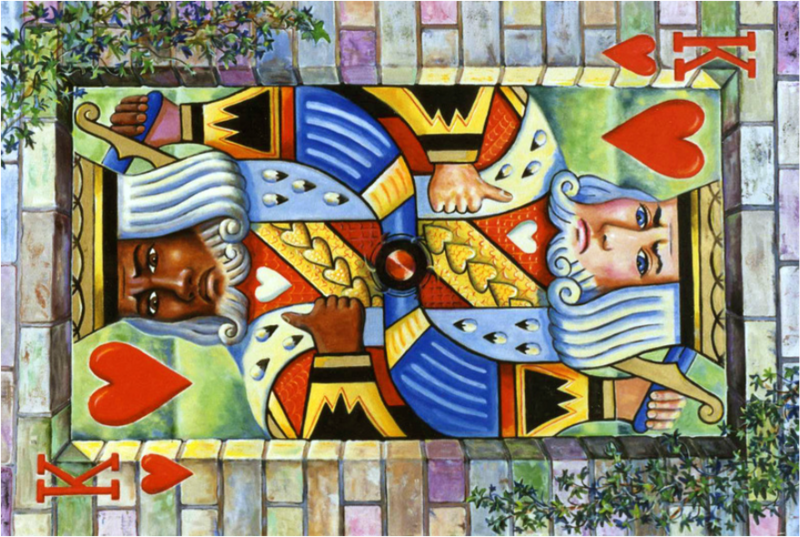 Therefore, this king of hearts claims for mankind not to have a racial problem but a "racial opportunity". For as Martin Luther King Jr. stated, "Either we learn to live together as brothers or we will perish apart as fools."